Travelling in Kazakhstan and also in Kyrgystan is getting easier and easier because facilities improve. That’s why we don’t hesistate to offer a summer family holidays. This is a 16-days tour starting in Almaty, ending in Astana and in between touring the countryside of Almaty plus the north of Kyrgystan. Much variety in this program; steppe & high mountains, lakes & deserts, Kazakhstan & Kyrgystan, luxe hotels & basic homestays, beach resort & mountain resort, and much more. This is an individual program which we can offer from June to August. It is possible to make a similar and tailor-made program. We call it an adventurous program because of the sometimes unpaved roads, the sometimes basic accommodations & facilities and because of the challenges of the Russian language especially in the countryside. Arrival at Almaty Airport, usually at night or in the early morning. Transfer to 4* hotel Kazzhol. In the afternoon a guided city tour to the Panfilov Park with the Zenkov Cathedral, the Kok-Tuebe Hill and more. You will spend today in and around Almaty. You will be transfered to the high mountains just south of the city (less than one hour) and enjoy a four hour excursion around the Medeo and Chymbulaq resorts, where skiing lifts can bring you all the way to the top at 3,100 meters, with stunning views. Transfer back to the city and leisure time, accommodation in hotel Kazzhol. The first day of a 9-day tour through Almaty Province and the north of Kyrgystan. Today will bring you to the village of Basshi in the Altyn Emel Nature Park, which is defined by its semi-desert landscapes. After enjoying lunch in your hotel in Basshi you will visit the Singing Dune, a further 35 kms across the semi-desert. You can climb this huge natural phenomenom that creates a singing tune when you descend it. Nobody knows when and how this sand dune appeared here. Return to your hotel, dinner and accommodation. Today lunch and dinner are included. Note: you can opt to stay another day in Altyn Emel and enjoy an excursion to the White and Red Mountains at 70 kms from Basshi. Then you will return to Basshi for the night. Please note that summers can be hot in Altyn Emel with temperatures of 40 degrees Celcius. From Basshi the journey continues through empty steppes and semi-deserts to Charyn Canyon. Here the car will be parked on top and in about one hour you can walk across the canyon till the Charyn river, enjoying the fabulous rock formations that formed millions of years ago. Accommodation in a large yurt. Lunch and dinner are included today. Walking back to the parking place you will continue to the Kolsai Lakes at the border with Kyrgystan. It’s not very far (110 kms) but parts of the road are rather bad. Arriving in the village of Saty at 10 kms from the first Kolsai Lake you will enjoy a lunch in your Kazakh homestay. After lunch an excursion to lake Kaindy (see picture below ) is planned. Be prepared to join a nostalgic Sowjet jeep for an adventurous (but not dangerous) journey of almost one hour to this remarkable mountain lake. After some time for a walk and relaxation you return to Saty. Lunch and dinner included today. You will exchange Kazakhstan for Kyrgystan today. After travelling north some 90 kms you will turn in south-eastern direction to the remote Karkara-Kegen border crossing in the middle of a mountain plateau. The landscapes are empty and breathtaking. You will see more horses than people. 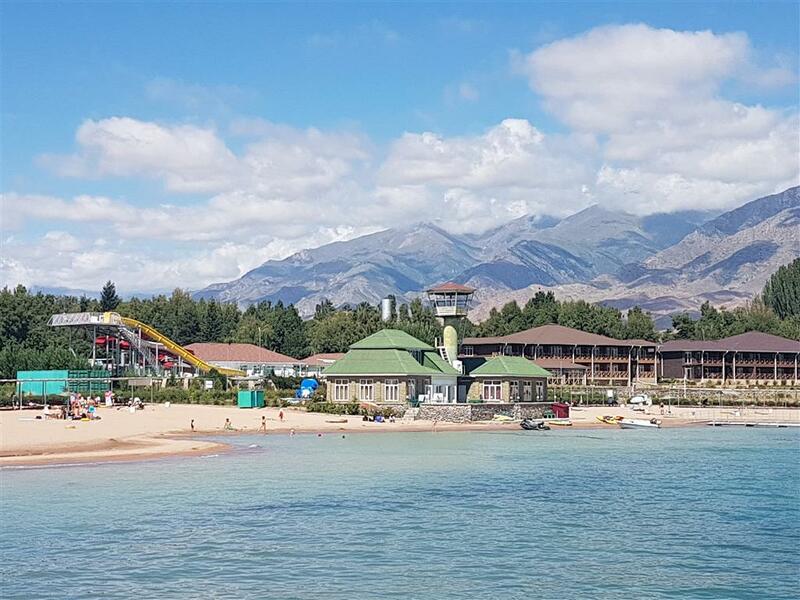 In the afternoon you will reach the Kapriz beach resort on the northern shore of Lake Issyk Kul. Here a completely different part of your holidays will start. Three days of relaxing at the clean waters of the enormous Issyk Kul mountain lake, situated on 1,500 meters altitude. Lunch and dinner are not included in our offer but there are restaurants in the resort and nearby. A day for relaxation in the resort. You may choose an excursion if you wish (not included). After saying goodbye to the beach resort the journey continues to Bishkek, the capital of Kyrgystan. On the way you may enjoy a lunch at a special and very popular (also with wedding couples) partly floating restaurant not far from the city. Checking-in in centrally located 3* hotel Shah Palace followed by a guided city excursion. Optional: excursion to the Burana Tower Complex on the way to Bishkek, requiring an additional 3 hours. You will return to Kazakhstan today, reentering the country at the busy border crossing very nearby Bishkek – quite different from the crossing four days ago! You will drive to Almaty and even a little further, to the mountain resort ‘Lesnaya Skazka’ (Fairy tale Forest in English), a former pioneers camp in USSR times and situated at 1,650 meters altitude. Its lodgings and facilities and also the restaurant live up to modern standings and there are plenty of activities possible here. You may climb rocks and trees, hike, ride a horse, swim, use the ‘ethno-spa’, take part in a paintball contest and more. Please note, most activities are charged. The restaurant offers Kazakh, Western and Georgian food. A full day in Lesnaya Skazka. You may stay in an apartment (included in our offer) or at extra cost in a spacious yurt. Leaving Lesnaya Skazka and the mountains today for the last destination of the tour, i.e. Astana, the new capital of Kazakhstan since 1995. You will reach it with the Talgo night train, leaving Almaty around 18 PM and arriving in Astana the next day around 7 AM. The train consists of four person (included) and two person compartments, all with sleepers. Even WiFi is available at a small charge. You may opt to leave Lesnaya Skazka in the middle of the afternoon or earlier, to spend some time in Almaty. After arrival around 7 AM you will be taken to 4* hotel Kazzhol in the city. After some rest a three hour guided city excursion is offered. The rest of the day you are free to walk between the modern and spectacular buildings that Astana is rightly famous for. Like the Khan Shatyr pyramid on the picture below, which holds an enormous entertainment center. In the night of days 15 to 16, or in the early morning of day 16 you will be transfered to Astana Airport for your flight back home. End of your tour in Kazakhstan and Kyrgystan. – at six persons at €1,250 p.p. – at eight persons at €1,140 p.p. – at ten persons at €1,080 p.p. Please write to info@kazachstanreizen.nl for different group sizes. The international flights are not included in these prices. There are discounts available for children younger than 14 years, depending on age. 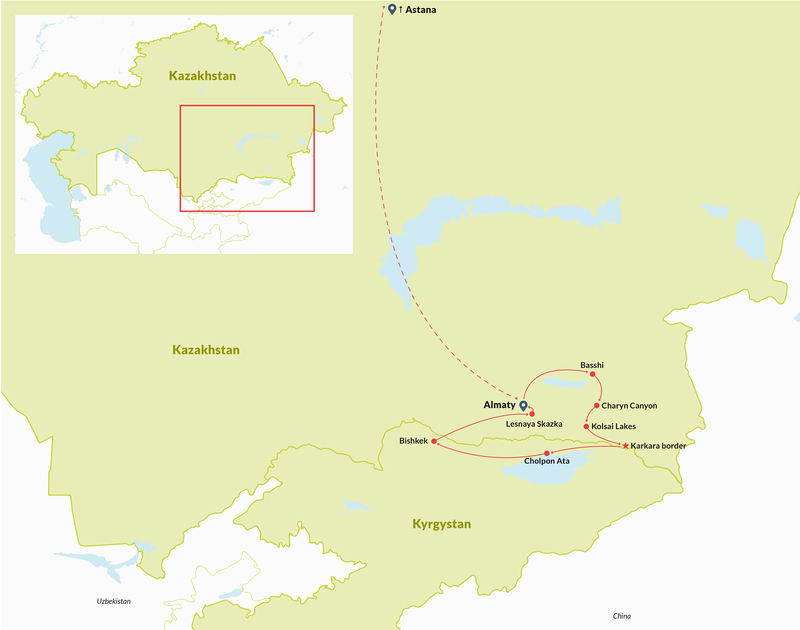 – services of a driver & car during the tour in Almaty Province on days 4-8. Please note that you travel with a driver who may speak a little English, but not with a guide. You may hire a guide at an additional cost of €90 per day. – all accommodations on the basis of bed & breakfast included and in double rooms or TWINs. Early check-in is included upon arrival in Almaty and in Astana. You will stay for two nights in 4* hotel Kazzhol in Almaty, one night in a small hotel in Altyn Emel, one night in a yurt in Charyn Canyon, two nights in a homestay at the Kolsai Lakes, three nights in a hotel in the beach resort Kapriz at Issyk Kul Lake, one night in 3* hotel Shah Palace in Bishkek, two nights in an apartment in mountain resort Lesnaya Skazka, one night in the night train Almaty-Astana and one night in 4* hotel Kazzhol in Astana. – an English speaking guide during the tour in Almaty Province on days 4-8 and during the transfer Bishkek-Almaty. You may hire one at €90 per day in total.